Using the methodology developed by the Mexican National Disaster Prevention Centre (CENAPRED), we assessed the housing’s structural risk to earthquakes and floods of the town of Motozintla, Chiapas, Mexico. Structural vulnerability was estimated by characterizing the local housing’s construction and by randomly and statistically selecting the surveyed houses. We assessed risk by superposing the vulnerability geographical information system (GIS) layer over the seismic microzonation and flood scenarios GIS layers previously generated for Motozintla. 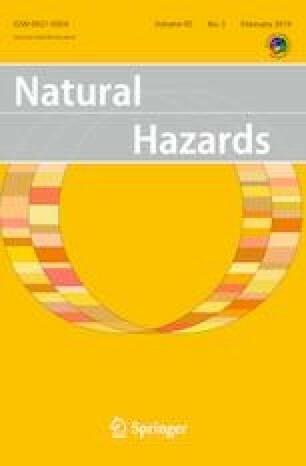 Our results indicate that in general, this community has high structural vulnerability and risk levels to the two analyzed natural hazards. Very high seismic structural vulnerability is concentrated mainly along the northeastern and western sides of the local Xelaju Grande River. Another major finding is that in the worst flood case scenario (precipitation of 528 mm/h with flood depth > 125 cm) more than 44% of the houses in Motozintla will be severely damaged. Risk increases due to the prevalent precarious housing conditions. The results of this research will allow local authorities to strength their civil protection plans. We thank the government of Motozintla for its support during our field works and for kindly providing their local data. The Program to Support Research Projects and Technology Innovation of the National Autonomous University of Mexico funded this research (UNAM; PAPIIT Projects Nos. IN118614 and IN111217).